FUN FOR THE WHOLE FAMILY - Unicorn Inflatable Pool Ring Toss Games are fast becoming the number one activity based game for the home. It's will provide hours of awesome family fun with the kids and it's also perfect when you're hosting or entertaining. GAMES FOR KIDS - Unicorn Inflatable Swimming Ring Toss Games can help positively channel a child's physical and mental energies, kids games can also help a child improve concentration skills and teach the importance of task completion: they can improve their own self esteem. OUTDOOR GAMES FOR KIDS KEEP KIDS ACTIVE - Unicorn Inflatable Pool Ring Toss Game help kids become more active and socially adept: not only do kids improve their interpersonal skills they learn valuable lessons about team spirit and healthy competition: a child can learn that it is healthy competition rather than winning that is most important. EASY TO INFLATE AND DEFLATE - Unicorn Inflatable Swimming Ring Toss made of PVC, NON-TOXIC, safety, strong & durable. 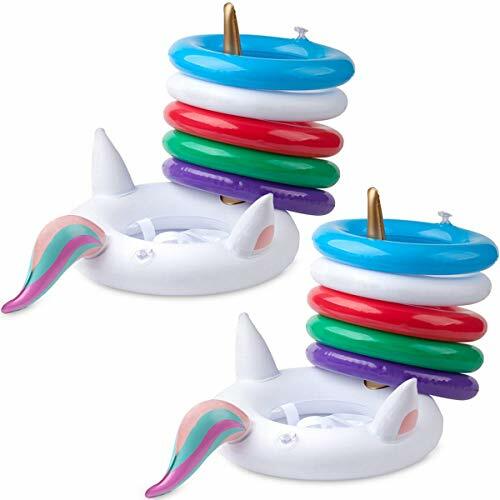 Each unicorn inflatable ring toss includes 5 durable inflatable rings. Totally 2 unicorn hats + 10 rings. COME WITH A GIFT BOX - Package by nice unicorn box, great for birthday gift, kids will love it. Whether it's for house hold parties, at the beach or the snow, around a camp fire, or just in the back yard, this ring toss / quoits game will provide loads of entertainment value.